Whether you know your way around the Hesburgh Libraries, or need to get to know them better, undergrads can show off or shore up their research skills for the sixth Undergraduate LibraryResearch Award (ULRA) competition. The event, featuring a top prize of $1000, is sponsored by the Hesburgh Libraries and the Center for Undergraduate Scholarly Engagement (CUSE). The purpose of these awards is to recognize undergraduates who demonstrate excellent research skills and who incorporate library resources, collections and services into their scholarly and creative projects. Submissions, which will be accepted through April 15, must include a 550-800 word essay outlining the library resources used in the created work, as well as a faculty statement of support. 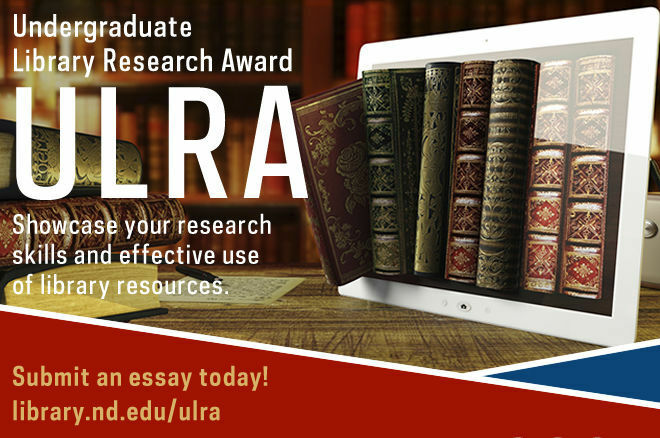 The ULRA selection committee will evaluate the entries, giving heavy emphasis to how well each essay demonstrates the understanding and application of a broad range of library resources and expertise. The first place prize for Senior/Honors Theses is $1000, and for honorable mention in the category, $500. In both the 20000-40000 and 10000 Level categories, prizes are $500 for first place and $250 for honorable mention. Winners will be recognized on May 1 at the Undergraduate Scholars Conference in DeBartolo Hall. For more information, visit library.nd.edu/ulra. Originally published by Jessica Trobaugh Temple at science.nd.edu on April 09, 2015.